Termites’ ability to chew through wallpaper, wood, and other housing materials causes billions of dollars worth of property damage in the United States each year. These sneaky little bugs can be surprisingly tricky to spot and can cause a lot of trouble before you finally notice them. It is important to know the signs of a termite infestation so you can properly address the problem if your house gets termites. How Can You Spot Termites in the Home? 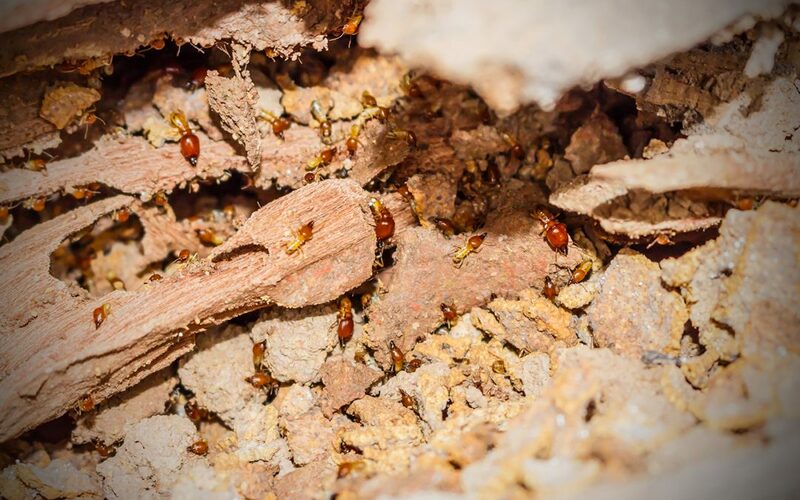 Not all signs of termite infestation are obvious, so it may take a little time to find out whether or not your house is infested with termites. Here are a few things you may spot if your home is dealing with a termite infestation. Wood that is being eaten from the inside by termites may look like it is warped. The wood may appear to be blistered or rippled from the pressure of the termites. If you put pressure on these pieces of wood, they will often crumble or have a slight give because the termites are damaging the strength of the wood. Wooden floorboards may also begin to buckle. Many species of termites cannot survive outside. When they are traveling from the ground to your home, they will build mud tubes that travel up walls or along the base of the house. These tubes of dried mud are typically quite thin and may branch off into many split areas. When winged termites find a colony, they will shed their wings and settle down. You can find these discarded wings near windows, doors, or entryways to the termite colony. Many species will also drag out dead termite bodies and place them outside the colony, so you may come across small piles of termite bodies. Contrary to popular belief, termites don’t actually leave behind sawdust. Their excrement is called frass and might resemble sawdust at first glance. Look closer and you will notice it looks tiny coffee beans. If you find piles of this substance around your home, it is one of the signs of a termite infestation. If termites have gotten into your drywall, the signs can be rather severe. The drywall may start to look discolored, or it might begin to sag and buckle. Any paint over the drywall may start peeling off, and if you look closely, you might see tiny holes in your drywall. What Should You Do If You See Signs of a Termite Infestation? If you notice these signs of a termite infestation, do not delay. These pests are constantly causing damage, so the longer you wait to deal with them, the more danger your home is in. Call a professional to identify all areas of termite damage and control the infestation. Once the termites are dealt with, take steps to prevent them from coming back. Keep shrubbery, firewood, and mulch away from the base of the house, and try to keep the home well ventilated. If you are buying or selling a home, it is important to know the full condition of the property, including the possibility of any past or current termite infestations. Contact Encompass Home Inspection Service to schedule an inspection in Southern New Jersey or Southeastern Pennsylvania.